When I started listening to fingerpicking guitarplayers more than 30 years ago, one of the contemporary artists having my attention was the Dutch string wirtuoso, Ton Van Bergeyk. 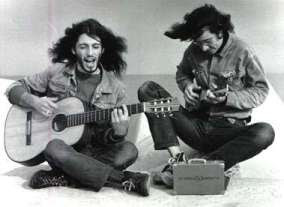 A friend of mine, who also was interested in fingerpicking guitar, had all the solo recordings featuring Ton Van Bergeyk, issued at the Kicking Mule label and produced by Stefan Grossman. 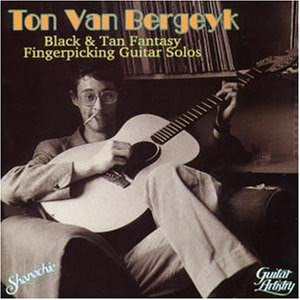 Frequently I met with my friend and we listened for hours to the genuine solo efforts by Ton Van Bergeyk. Right from the start we realized that Ton was a true master of this guitar playing style, a great arranger and unique performer of complex music covering blues, ragtime and jazz of the 1930s and 1940s. The shown cd is a compilation of material from Ton's Kicking Mule recordings, it was issued 1992 by Shanachie (CD 98018) and may be hard to find nowadays, but it's certainly worth searching for. There are 19 tracks, mostly jazz standards, some blues and novelty rags and info notes by fellow guitarist Duck Backer. Ton stopped his career gigging as a solo fingerpicking guitarist during the 1980s and was for some time into computer business, but soon returned as a musician taking part in various Dutch bands, among these were The Boulevard Of Broken Dreams and The Gangbusters of local fame. During the 1990s Ton participated in The Beau Hunks, the excellentt Dutch big band specialising in reliving and recording forgotten music of the 1920s from the original arrangements. 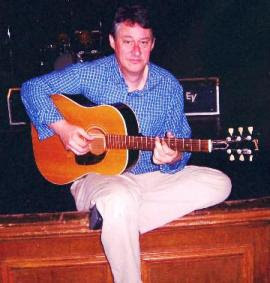 During this period Ton concentrated on playing rhythm guitar and once in a while banjo and ukulele, a practise he has continued to this day, now as a regular member of the well known Dutch Swing College Band. I had the pleasure of meeting Ton in person a couple of times. November last year the Dutch Swing College Band toured my region of Denmark - the picture above is shot at one of the band's concerts then. After the concert I had a chat with Ton, remeniscing his days as a solo fingerpicking performer. During our chat Ton told me that he never stopped playing fingerpicking when at home. In fact he had just started to upload some videos at the internet under the pseudonym Pekka Paska just for fun - he choose to upload as a pseudonym because he wanted the viewer to concentrate on the music, not on the person playing. Below I insert one of his videos to show you that this fingerpicking wizard still knows how to strut his stuff - enjoy Ton playing a piece titled "Sweet Swinging Blues"
Thanks to point our readers to this great fingerpicking guitar master !! I agree with Hans, Ton is great master of guitar! want to buy his book about Ton. I understand that Stu only produced about 20 of these books. I think I've got No. 19. I've since met both Ton and Duck Baker and had them both write comments in and sign the book. It is now, of course, a very prized and valued possession. Yes, Ton is a master of this style. A fan for many years, I actually own the Gibson guitar Ton is playing in the first picture here ! I've been listening to Ton for many years, and each one of them has rewarded me with more pleasure. His use of the 'dropped' D tuning is incredible, adding nuances one could have never imagined. What a true genius! Perhaps only 'Duck Baker' or Lasse Johnasson are in his league..If you have never heared them either, give a listen!